The first and fourth quarters of the shield are tinctured red, the color of the Humanity of the Lord, and the cross is gold, the color of his Divinity. 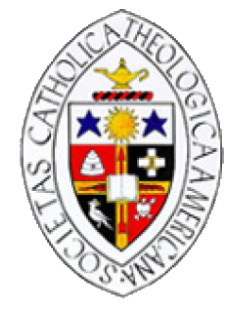 The cross of our salvation is an appropriate charge with which to quarter the arms of the Catholic Theological Society of America. The open book refers, of course, to the Sacred Scriptures. To represent Tradition, the four Doctors of the Church who support the Cathedra Petri, enclosed in a casing of bronze above the apsidal altar of St. Peter’s Basilica in Rome, are represented by their symbols in the four quarters of the shield. Two are of the Latin and two of the Eastern Church. The beehive in the first quarter represents St. Ambrose, on whose lips as a young child a swarm of bees is said to have rested as a portent of his eloquence. The symbol of the cross with the two rings in the second quarter represents St. Athanasius. Since “Athanasius” is from the Greek meaning “without death” or “immortality,” a black field has been chosen to symbolize death and the cross is silver (white) to carry out the meaning of his name. Silver is the color of light and it is accentuated by being placed on a black background. The two circles, or rings, interlaced to symbolize unity in one person, represent the two natures in Christ, substantially joined, which Athanasius defended. They encircle the cross, the symbol of faith and of Jesus Christ, to bring to mind the Athanasian Creed which derives its title from this great Confessor and Doctor of the Church. The form of the cross used is Eastern, commonly known as the Greek cross. The third quarter indicates St. John Chrysostom, Archbishop of Constantinople. His name means “golden mouthed.” It is said that a snow-white dove flew into the church at his ordination. The beak of the dove has been tinctured in gold to symbolize his name. The black field was chosen to artistically balance the second quarter. The fourth quarter bears the flaming heart with the two arrows to represent St. Augustine. This is the well-known symbol of the Bishop of Hippo. The cross itself is the background for charges representing two recently declared Doctors of the Church. Passing behind the open book on the vertical arm of the cross is a red arrow. This represents St. Teresa of Avila, who described one of her spiritual experiences through the image of an angel wounding her heart with a dart. This transverberation, partly because of Bernini’s depiction, became a common symbol of Teresa and her writings. A red quill pen, on the horizontal arm of the cross, represents St. Catherine of Siena. It calls to mind her writings and her authority. Its red color symbolizes Christ’s redeeming us through the shedding of his blood, which is a theme prominent in her writings, as well as the gift of the stigmata which she received. The order of the quarters follows chronologically the dates of birth of the four early Doctors. The first Latin Doctor, Ambrose AD 340, is in the first quarter; the second quarter portrays the symbols for Athanasius AD 296, the first Greek Doctor; in the third quarter Chrysostom AD 346, the second Greek Doctor; and in the last quarter Augustine AD 354, the second Latin Doctor. The Greek Doctors are placed between the Latin Doctors in the first and fourth quarters.